Ruth Kirkham is a name that has become synonymous with Lancashire cheese since she began producing her traditional raw milk cheese in 1978, although she has now passed on the mantle to son Graham. Made with raw milk and animal rennet, everything is done by hand, save the peg mill, which mills the curds. 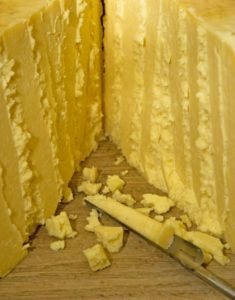 The cheese is then clothbound using a buttered cloth whilst it matures.